Some people do not plan for their future beyond a simple savings account or a stock portfolio. Yet what good will this do in the case of a major economic collapse? One way to safeguard yourself against financial disaster is to prepare for it today. Jason Hartman’s Meet the Masters if Income Property Investing conference can be the perfect tool to help you prepare for your future. You will meet top members of the financial community who can give you advice on rental property investing – from selecting ideal properties to acquisition to management. These same people who refuse to plan for their financial future do not seem to understand the importance of survival preparation. Some people think that survival preppers are crazy. They think that they’re overly worried and even obsessed with a doomsday possibility. Perhaps your spouse or another loved one feels this way. How can you convince them otherwise? · Natural disaster: Whether you have to evacuate quickly, are left without power, or have your home destroyed, you will find that just a little bit of preparation will go a long way in a natural disaster. 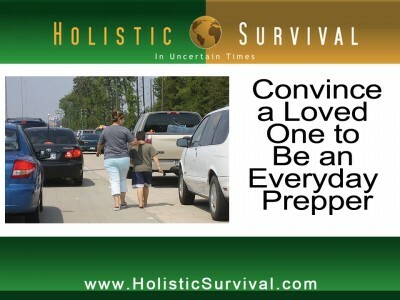 · Evacuation: Speaking of disasters, imagine having to leave your home quickly. What will you take? Do you know where your family birth certificates or other important documents are? If you have to leave quickly, it woud be nice to have everything in one easily accessible location. Plus, if you’re a prepper, you’ll have extra gas on hand to fill up before you even leave the house. · Fire: Preparation for a house fire is the only way to feel secure in this scary scenario. Make an evacuation plan, set a safe place to meet outside the home, and practice, practice, practice. · Power outage: Hurricanes, snow storms, lightning storms, and many other situations could cause you to lose power for a long period of time. How will you feed your family? How will everyone keep warm? · Unemployment: The economy is not getting any better and more and more people are losing their jobs every day. Planning for your future with extra food and investment properties will ensure that you will never be caught off guard.